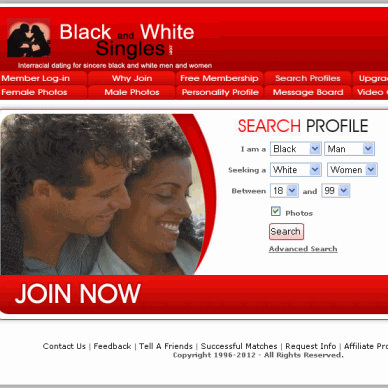 Black and White Singles is our #9 choice among the interracial dating options online. There are thousands of active black and white profiles on the site, actively seeking a special someone, irrespective of the skin color. Members can exchange emails and ask or get answers to various questions, exchange ideas and opinions till they are ready to meet face to face. The first step is to create your profile by completing the questionnaire, but many of them are also optional, so you can skip these. You can then add photos and videos to your profile. All members are allowed a maximum of 5 photos. Upgraded members can send emails. You can set your photos or your video clippings to be viewed only with specific permission, for all members, only for VIP members or just hide them. All members can send flirt messages found in My Flirts link or send smiles from the My Smiles link. After joining as a free member, you can start searching based on a simple search specifying what you are and what you are seeking, male, female, age range, city or by username or keyword and so on. In addition, there is an advanced search, a search based on saved criteria and a travel connect search. In advanced search options, you can name a search and then later run the saved search by clicking on the Saved searches. All members can create a photo profile and read emails sent by other members. Free members can also send and receive smiles and flirts. VIP members can have greater control over the features of the site. Free members can respond to an email, but VIP members can initiate an email. You can opt for a one-year membership of $47.88 at $3.99 per month; a nine-month membership of $44.91 at $4.99 per month; a six month subscription of $35.94 at $5.99 per month or a three month subscription of $24.99 at $8.33 per month or a single month subscription of $20 per month. A VIP member can send unlimited emails and access or create a video profile. They can also send video instant messages and access saved searches. Trip Connect and Video connect features are only available to the VIP members. You can also create a list of favorite members and block a member if you do not want him or her contacting you. This feature allows the members to have a video conference with other members using a webcam on the computer. If you see the ‘Online’ near the profile, you can start with text messaging or even a video conference. In addition, members can also record video profiles and other members or the selected members can view this. The feature is very beneficial; as you can know more about a person and his or her character through the video, before planning a date with him or her or before you give them your number. You can ask questions and receive responses. Registered users are allowed to take a personality profile assessment. This helps them to get to know themselves as well as the others better, so that they can find a perfect match suited to their personality. There are sixteen types of personalities, such as ISTJ, ISTP, ESTP and others. The feature allows you to meet other members who are travelling to the same destination as yourself. You can search for them and find which of the members are going to the same destination. In order to perform this kind of search, you must click on the relevant trip connect link and enter the range of the dates that you are interested in meeting another member during a travel. It is also possible to add the trip calendar, so that others can view it and meet you. Once you have added a trip, you can delete it, add details or edit it using the navigation control. The message board is a kind of blog that allows the members to share their ideas or their opinions on various topics. You can start a topic or merely reply to other conversations started by other members. You can suggest a category, but it has to be moderated and approved before it is posted. The site brings in a lot of novel features to bring members in contact with others suited to their personality. The Personality profile questionnaire is based on accepted psychological theories used by professionals and is effective in bringing like-minded people together. One of the major problems of this interracial dating site is that the features and icons get loaded very slowly. In our view, the site offers good value for money, as it has plenty of novel and interesting features for bringing you close to other people of different cultures and ethnicities. The travel connect is a very useful feature.